Serve with applesauce or yogurt. Lightly spray a cookie sheet with sides or two 9x13 inch pans with cooking spray. Lay the slices of bread flat on the pan with the sides touching. Beat egg, milk, brown sugar, and vanilla until very well blended. Pour mixture over bread. Turn each slice over to ensure both sides are wet. Cover and refrigerate overnight or bake immediately for 30 minutes. Serve hot. Sprinkle lightly with powdered sugar (optional). Top with applesauce, fresh fruit or yogurt. 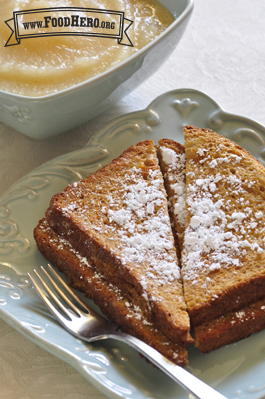 3 Comments for "Oven French Toast"
My family LOVES this! I used thicker wheat sandwich bread and i only needed 7 slices to cover the recipe. And then i made the topping from Food Hero Blueberry Bling and put it on top of the french toast before i cooked it. My familys fav breakfast recipe! Good, I served it topped with strawberry yogurt. Really liked the french toast. It was just the right sweetness level.